I have been debating writing this entry because I am simultaneously excited and scared of disappointment. Last week, I passed an RV in a driveway in Derry that was for sale. It looked like a decent, small class C and had a posted asking price of $5,000. 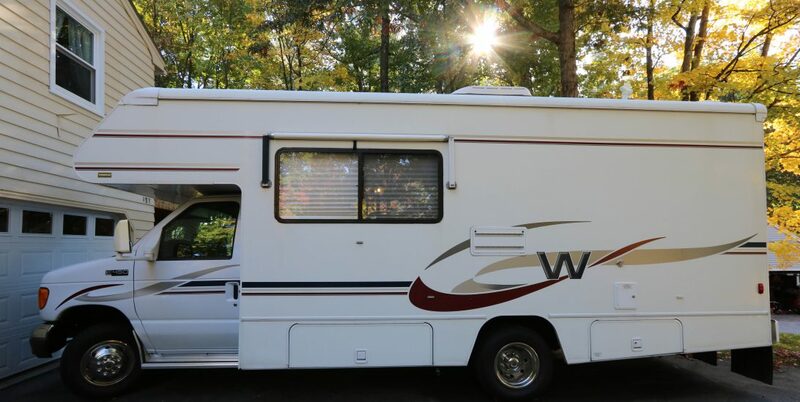 I knew enough from all my research (hard to believe, but we have been RV-shopping on some level for more than six months) to know that I would be extremely hard-pressed to get a working RV without really high mileage at that price. I also knew that our goal of only spending $10,000 on an RV would be really tough in NH – there doesn’t seem to be many selling for less than$12-15K on the private market, and dealers are usually asking $20+. So I told Ross about it, and within a couple of days, we made time to stop by. First off, we are wusses. It is so nerve-wracking knocking on strangers’ doors and asking for something! Billy seemed like a super nice guy, helping out his friend by letting his RV sit there in the driveway for sale. He didn’t know much about it- for instance, he quoted us 1998 as the year of this Minnie Winnie, but I was convinced it was from the eighties and looking at a few pictures of paint jobs confirmed that. But he couldn’t have been nicer and told us his friend Rainy was the second owner, had bought it to go to a music festival this year,and everything worked great. After the research I have done, phone calls with Rainy, etc., I think this is a Minnie Winnie with a 24R floor plan from 1988 or so. It is 24′ 1″ long according to Winnebago, and it should have an A/C in the truck, heat and cold air, enclosed shower, marine toilet and little sink, dinette, chair, captain chairs that swivel and a full bed. It has fantastic storage, including a spice rack and a magazine rack, but it is really tiny of course so even having a few wardrobe spaces can’t make up for that. No slide outs, which makes it easy, over cab storage, which is where most of our gear would need to live, at least while parked, and it has a new fridge, an oven, microwave, stove etc. It is smaller than the RVs we have preferred thus far, but that simplification may mean better gas mileage, and more importantly, it means if we find it isn’t practical to travel with a car, it will be manageable in cities. Not easy, but it can be done. I am sure that we would ditch the dinette and replace it with a compact desk for the two of us – perhaps something that can double as a table if needed, or perhaps we buy a folding table. Other extras I forgot about include a grill, a Honda generator, and I think he might be throwing in camping chairs and such too. There is also a CD player that has been added, tire replaced recently, etc. Some sort of exhaust manifold leak needs fixing. We can really see ourselves in this for year 1. We know we would eventually want to move up, but by all accounts RV repairs are inevitable, old or new, so this price point is really appealing. We would spend another 1.5K for covered storage this winter – a good chunk of change, but given the fact that I haven’t found any vehicles I would remotely consider in NH under 9K and the fact that once we have our RV, we can stop wasting time/money/gas looking for one, I think it would be worth it. So we are trying to go into this open-minded, but it is really hard to keep perspective and not get our hopes up. It is a really old vehicle. If my mechanic finds other issues and wouldn’t recommend it, I don’t want to be hassled with it for sure given our plans. If we take it to the campground and things aren’t as we had been told, ditto. I said to Ross, “Wow, this is like buying a house!” And he said “Yeah, it kind of is”. Duh, as we used to say! I am thankful our mechanic will humor me and take a look. I am also thankful my dad was so supportive of our plans when I called him – he and hopefully his wife Karen, who has owned trailers, can join us to check it out. I have transferred 5K to my account so it will be ready to go. Just need Ross to confirm if we are going cash, check or what. And I need to research and calculate – already found the manual – to figure out how much we can load this thing up without killing our tires or RV. Wednesday is the day. Stay tuned and keep us in your thoughts!